About 45 years ago, give or take a day, is when my memory begins. 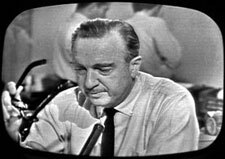 I remember the black & white TV, on the wire rack stand with the plastic clear wheels, bringing the images of Walter Cronkite, a caisson, a horse with the boots backward in the stirrups, and a little boy, about my age, saluting. I remember realizing that it was very sad. For all that this event has done and meant to the collective consciousness and memory of this nation, it is that benchmark for me. The fortunes of JFK's memory, from incredible American Hero and martyr to womanizing drug-abusing power-monger to the eventual accommodation that he was all of these things has mirrored my childhood, adolescence, adulthood, including my "middle-age" sensibility whereupon it is indeed possible for one to be all of these things at once, given enough money, power, and opportunity. Was George Washington, who could never tell a lie, also a wildly successful land speculator who rebelled against the government's efforts to limit his holdings? Yep. Is it possible for a leader to have a vision and mission for a nation/group that flies in stark contrast to their own secret desires, flaws, and appetites? Apparently so, it seems to happen all of the time. Does the power corrupt, or is it exactly this quality of capabilities, ambitions, and impulses inherent in these individuals that brings them to these roles? Nature/nurture/chicken/egg? Why do painful childhoods produce stand-up comedians? Why do we park in a driveway and drive on a parkway? Questions for the ages, I suppose. I have been shaped by the media. There is a CRT or LCD in 5 of the 7 main rooms of my home. My particular background was one where television was regarded with some conflicting emotions and attitudes - awe at the shrinking nature of the world and the growing speed of information, suspicion of the moral impact of such a device into what had, up until then, been the safe moral harbor of the home. There were only a few channels then, too, and the days of JFK were still run by an elite group of old-school newsmen and network heads who had ethical standards that they embodied by their control of the airwaves. The personal lives of public personalities were crafted, accepted, and the realities were off-limits. It was a matter of respect, to some degree, for how we wanted to be as a culture. Today, the results of the abuse of that respect - Vietnam, Watergate, Iran-Contra - pick your poison - along with the explosion of media outlets (including this one) mean that we are all "on", nearly all of the time. I see no need to Twitter, but people do. My workplace is becoming increasingly covered by cameras, and employees and equipment wear badges that pinpoint their presence in the building. I am monitored - for various reasons - when I watch TV via my cable box, when I surf the Internet, when I purchase goods with 'club' cards, etc. etc. etc. I fully anticipate - and sometimes welcome the thought, what with all of the user names and passwords I almost manage - an RFID implant that would provide me with coordinated access to all of the things I now access. I began to leave a trail of minutiae on the Internet that I'm told will last for generations, or until the next great electromagnetic pulse that comes either from outside or off the surface of the planet. We've been provided with many different sets of privileges and responsibilities. Like that 'idiot box', the reality brings awe and fear at the same time. What's my point? I don't really know, it's just what I've been thinking on this anniversary. Just as my Grandfather saw life go from horses and outhouses to a Lunar Landing and toilets with warm water jets, I'm not sure what's in store for the rest of mine, but I know where it began. It was TV. I am not known for the quality of my memory. I do remember the night when Samuel was born, 12 years ago, yesterday. The doctor saying, "You've got a towhead, there! His first cries. My first words: "Hello, Buddy!" Walking out into the air, about 2 or so in the morning, looking up at the stars, and feeling the earth shifting under my feet, and the distinct realization that everything had changed. The pediatrician, eying him for the first time, saying "You've got a week-old baby there." Yeah, he was late. I can't say that I blame him. He's always known a good thing when he sees it. Samuel means "God Heard." He was an answer to prayer, the culmination of so many complex threads and events that had proceeded him. We weave those threads, good and bad, on a daily basis, some on purpose, some without our desire and even control. Samuel was, and is, our best declaration that life was worth living and investing in. The process of enabling Samuel laid the groundwork for what was to follow. I used to joke, before I had them, that parents got the children that they deserved. It, of course, is not up to any of us to make that judgement, but we sure deserved Samuel. Through the alchemy of nature and nurture, he is that mixture of what we are, are not, and what we want to be. Sam is sharp. He is funny - he has to be to survive around his dad. My biggest problem with him has been that, because he's so smart, he's had to endure more than his share of my sarcasm - and I've had to be reminded, time and again, that he's still a boy. A 5 foot-6 boy whose nearly-adult voice made me shudder when I spoke with him on the telephone the other day. He's terrific at math - he has to get that from his Mother. He, without my knowledge or approval, chose to play the cello. I approve, it just, well, startled me (it was my first instrument of choice). I can't play computer games against him, because he embarrasses me in front of his friends. I suppose I deserve that. He has an incredible imagination and can write stunningly descriptive fiction. He is compassionate, and he both sees and steps up to help those in need. He loves his sister, through all of the complications that she presents to his daily life. He's had to learn some things that many never will. He has my ultimate respect for these things. There's still a lot for all four of us to do, and I've been struck with the growing sense of our time getting shorter to do the best that I can do. We both need to work together to make some stuff happen, and it's not going to be easy. Teendom, here we come. I love you, Samuel. I hope someday you can know the joy that you've brought me. I haven't been writing much. One of the reasons is that I've been reading Roger Ebert's Journal. Through his physical travails, including the inability to speak, his writing, particularly the creation of his blog, has become quite phenomenal. It's the purification born of the refiner's fire. For me and writing, however, it's been like coming home from a Peter Gabriel concert- I can't entertain the thought of playing my bass for quite a while afterward. Tinny, out of shape, incompetent in the face of greatness. Another reason for my absence has been to resist the temptation to say something stupid about our recent 'troubles' , er, I mean, election. There was enough of that available for you, already. The comments made about Senator McCain's concession speech, though, was the catalyst for this essay. Several commented on how "gracious" it was - and it was. It has been my sad experience that many of these great men who are in public service seem only able to exercise this grace in private, or at the end of political campaigns. The process seems to make it impossible. Most of the Presidents in my memory have been smarter and of more value to me after their terms were completed. They were no longer posturing, they were able to fully speak their minds and display wisdom that was somehow obscured by their office, the need to skew and spin, or the Machiavellian machinists that seem to gravitate to the power of the office. That's a whole other kettle of fish. I began to think about Grace (with a capital "G"). I began to seek it, a bit more than usual. This one was easy, it happened yesterday, in an instant. Walking in the hallway at work, running into Sister Leonita ('gracious' is not the first term I think of in terms of all of the Sisters of Mercy that I've met, but Sr. Leonita embodies it), we're going the same direction. There's a patient in a wheelchair moving ahead of us, slows us both down a bit, just the normal traffic, you know. Sister says hello to him, asks where he's going, and then says, "Can I help push you there?" Sister Leonita is about 5 foot 3, her age a Mediterranean mystery. Patient agrees, and they head off. I think, suddenly, that I should have thought of that; stupid galoot. Sister Leonita's grace surpasses her vows and job description, it is part of who she is. Grace is always extended, offered, presented. Unlike trust, it does not exist on a two-way street - there's no implied contract. It exists without a requirement for reciprocation. It is the result of the law of sowing and reaping, a by-product of a previous investment. Graciousness, at least as far as I've been able to think about it, always comes from Gratitude. The cost to the one being gracious, while sometimes difficult, comes from the heart, which, by nature, gives in the knowledge that love is its reason for being, and is rewarded by the act itself. Grace, then, is not tentative, it is self-confident. Grace is a manifestation of Love. It is why Grace is recognized "under fire". I am able to be gracious when I have something to give, realize it, and offer it to you without qualification. I guess what I've been thinking about, too, is when I and others aren't gracious. It's boiling down to selfishness, mostly, I suppose, the antithesis of grace. There's more to it, I'm sure; I haven't been googling "Grace" or seeking theological tomes on the subject, it's mere rumination on my part (and yes, I intend the analogy of turning it over and again in my gut, thank you). It's the realization part, the awareness aspect that's been gnawing at me. I'm sometimes not aware of an opportunity to be gracious, sometimes, like the example above, it's not realized until the opportunity has passed, and, at still other times, there's awareness, opportunity, and selfishness intervenes to prevent the flow of what should be. I am less apt to be gracious when I am at my worst - tired, frustrated, etc. - which means that Grace is also a product of the self-discipline of awareness, of taking care of oneself, of being able to do the right thing because you already are. Grown-uppedness. Grace is, then, a quality of a certain maturity, although my children offer it to me on a regular basis. Grace is a particularly appropriate subject to be on one's mind in the runup to Thanksgiving (yes, even those of you across the pond who may not have a formal day for it in November). Maybe that's why Thanksgiving comes before Christmas, on the calendar, not after. I'm not being theological for a reason. The Grace of God is not separate from this discussion, it's just too huge for this little essay. My daughter (and in this way opens the door to so many mind-boggling ways to portray who the rest of us really are) exists in a constant state of Grace. Provision is made for her every need, and her responsibilities are few. She does not know what she needs, she thinks she knows what she wants, and pitches quite a fit when her agenda doesn't match the greater one. She's quite unaware of the dangers that surround her, and disregards the warnings and barriers put between her and those dangers. She often has no understanding of the efforts on her behalf to educate and make her life better. Her awareness of concepts of time, love, what it means to be happy, exist in different dimensions of comprehension than mine. The result of our extension of that grace to her, through responsibility borne of love, brings a happiness and joy to us that is boundless and indescribable. Emma has brought me more enlightenment on the nature of God, I think, than anyone or anything. Just a note, there. I have existed in many states of Grace. Most of you that come to mind that might read this have extended that Grace to me in many ways, shapes and forms, even if that just means reading this. Thank you. Our lives are really all "grace periods", from beginning to end. Here's to sharing it more often than not. We had a rather pleasant end to a pretty stressful week. Sam went Trick-or-Treating with Ryan, from across the street, and we went around the block with Emma - she dutifully walks to the front door, holds open her bag, says "Haiee" and "Baiee", and, while she enjoys this bizarre annual ritual, I don't think she's particularly jazzed about the whole thing. Dressing up, of course, is the best part, and Nana crafted the lovely costume for this year's festivities. We came home with Emma, she sorted through her candy, and even gave Mom & Dad some, and Sam called from Ryan's to let us know that they were hanging out there, for a while. Sam's voice, particularly over the phone, is surprising me these days. Testosterone. There were even less decorations, and less lights on in the neighborhood. I think that there are a lot of reasons for this, and it may be just the particular niche that I live in. I know that my parents have run out of candy (yes, Dad goes and gets more!) in recent years at their house. I think that next year we may have to seek our amusement elsewhere. That, in itself, is one of the reasons. . .